All AGC’s Member Organisations are actively participating in the AGCC 2018 Program. AGCC 2018 will incorporate the GSA’s Earth Science Convention for 2018 and the 2018 Australian University Geoscience Education Network (AUGEN) meeting. We invite all AGC Member Organisations, specialist groups, standing committees and other Geoscience-related bodies to conduct their business meetings at the Convention and take advantage of the synergies and networking opportunities offered by such a large event. their meeting in late August, 2018. 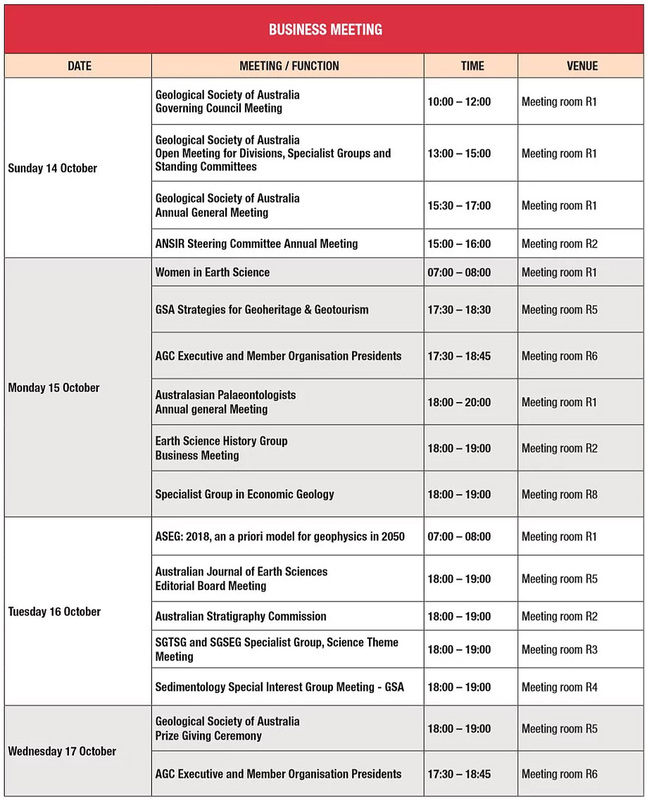 All meetings will be held at the Adelaide Convention Centre and scheduled to occur during the official AGCC dates. It is anticipated that most meetings will be scheduled for late afternoons or early evenings.